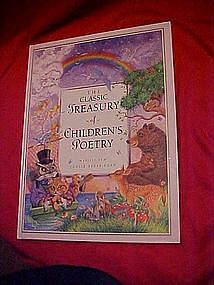 The Classsic Treasury of Childrens Poetry, WONDERFUL!! Another nice childrens book in mint condition! this one has 48 diffrent poems and each page has colorful lavish illustrations. Illustrated by Richard Bernal, Mark Corcoran,Debbie Dieneman, Gary Gianni, John Gurney, Barbara Lanza, T. Lewis, Michael Montgomery, Robyn Officer, Karen Pritchett, Jim Robinson, and Jada Rowland, Whew!! 56 pages of fun wonderment for your child. Book is hard cover and measures 10" x 13 1/4". Never been read. Published 1990.